MMI Research Center will support and conduct basic and clinical research on Āyurveda and Yoga with an emphasis on their application to the health and well being of individuals and communities, in partnership with academic institutes, research centers, integrative medicine centers, and those in private practice, both in the USA and internationally. Join us for a 3-day symposium from August 9-11, 2019 advancing health and healing through the integration of modern and traditional sciences. Research presentations and workshops given by leading scientists of integrative science and students of Ayurveda and Yoga (Presenters to be announced). 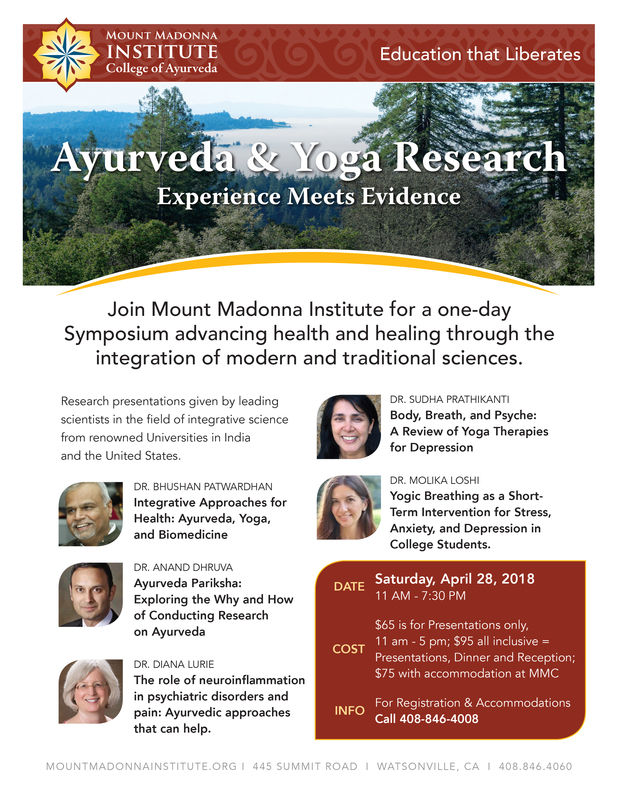 For Registration and Accommodations please contact Lauren Yuncker, Registrar, Mount Madonna Institute at Lauren@mountmadonna.org or 408-846-4091. Dr. Diana I. Lurie, Ph.D.